You are right Joseph Brodsky. And another is not sticking to the story when you adapt a book for the screen. A good story is like a diamond; to be treasured, not tarnished. Yet directors insist on treating them like clay. So one lengthy and expensive pottery class later, fans are presented with mediocre earthenware as opposed to the expected diamond. My latest diamond to be molded and shaped into pesky pottery was Divergent. Premised on a wonderfully imaginative concept, Divergent by Veronica Roth is a journey every avid reader should embark on. 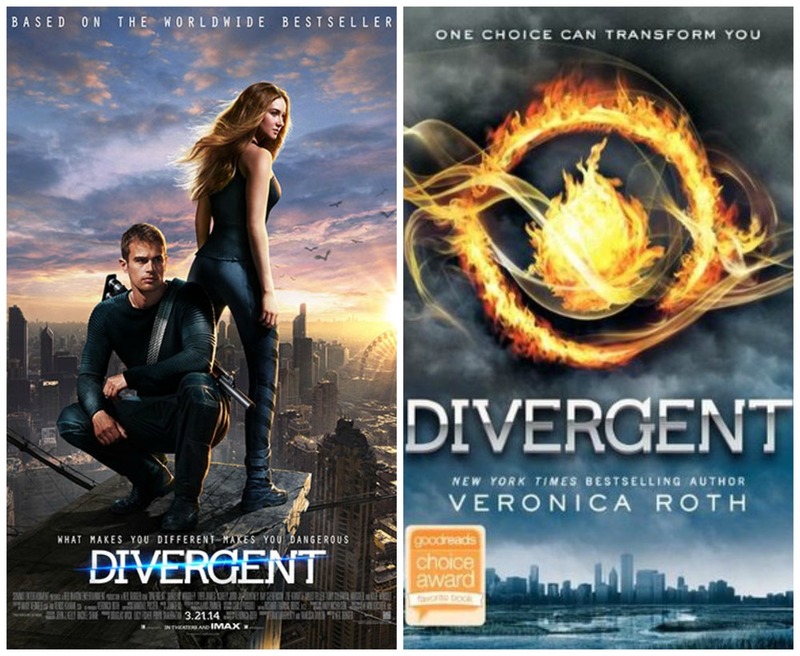 Divergent directed by Neil Burger however, is a journey you should leave at the very first turn off. I understand the complexities involved when altering a book into a film, but too great an injustice was done to this story. Don’t believe me? Then read on to see the most distressing differences between book and movie. Tris’s Red Carpet Makeup - Members of Abnegation are not allowed to wear make-up because it is a sign of vanity and self-indulgence. Hugs and Kisses - Displays of affection are rare in Abnegation as members are taught that physical contact is powerful and they should be wary of it. This faction fact is dismissed in the movie when Tris’s parents hug her and tell her they love her. Children should be seen and not heard – Abnegation children are not meant to speak at the dinner table unless their parents ask them a direct question. Yet in the movie, Tris and her father happily engage in a game of twenty questions. Liar Liar – In order to rule out Candor as a potential faction, Tori created a scenario where Tris had to lie to a man about whether or not she knew a ‘brutal murderer’. In the movie, the aptitude test finished when she threw herself on the dog. I guess congratulations are in order Tris. Apparently you show a disposition for Candor as well. I’m sorry, do I know you? - No, you don’t. I’m Uriah. Despite my significance in the book, the director thought I wasn’t important enough to be a part of Tris’s core friendship group. Big Ol’ Softie – Peter was about as violent and psychotic as the big bad wolf. He kept his hands to himself and his butter knife to his bread. Even his verbal sparring was disappointingly dire. A crucial storyline in the series, the animosity between Tris and Peter in the movie couldn’t have even blown down a house of straw. An eye for an eye – Actually no, change of plan Edward. You can keep both your eyes. In fact, I’ll do you one better. I’ll barely include you in the film, even though your character is important to the storyline. No need to thank me. Paint the town red – Are you ready for some faultless logic? On account of their violent nature and a PG13 rating, the decision was to remove numerous scenes from the movie. However, in ‘Catch the Flag’ darts which stimulated gunshot wounds were used in favour of conventional paintballs. I know, it makes perfect sense. Sisters are doing it for themselves. – But they shouldn’t be. Whereas Tris and Christina share the victory of ‘Catch the flag’ in the movie, in the book Christina actually gives Tris a patronising look while telling her “You’re already the hero of the day and you know you can’t reach it anyway”. Four Real?! - Four takes a more proactive approach when helping Tris. Instead of scolding her and giving her the death stare, he demonstrates how to complete the stimulations without arousing suspicion. I could have forgiven this change if not for the choice of location. Four’s landscape. Tris did accompany Four in his fear landscape in the book but it was a romantic gesture not a tutorial. Romance really is dead. A brief encounter – Tris met Jeanine for the first time when she went to Candor headquarters to talk to Caleb. In the movie, Jeanine is introduced at the first plausible moment. Neil Burger’s impatience definitely tested my patience. Omniscient and Omnipresent – And from then on, whenever Kate Winslet could be given air time, she was. Her presence was like an unwinnable game of whac-a-mole. I couldn’t help but admit defeat when she attended the final round of Dauntless initiation. Stayin’ alive, Stayin’ alive – But you shouldn’t be! One of Tris’s fears is being forced to shoot her family. Unable to do it, Tris turns the gun on herself. You don’t remember? That is because she shot her family without a moment’s hesitation in the film. Oh, you mean you don’t remember the entire sequence. Yes, it was all different. Hide and go seek – So, a mind controlling stimulation serum has been activated and all but the Jeanine Team are victimized. I know! I’ll disregard any common sense and go look for my family. I think there is a reason Veronica Roth didn’t put that in the book. Right tighty, lefty loosey – Tris got shot in her right arm in the book. She got shot in her left arm in the movie. I can’t bring myself to say more than that. The nail in the coffin – The end of the movie was so different from the book, I got whiplash from the amount of double takes I had to do. First of all, Tobias is meant to be alone in the control room not surrounded by Jeanine and the Erudite cartel. Secondly, Tris does not throw a knife at Jeanine’s hand. But if you are shooting her in the wrong arm, why not throw caution to the wind. And finally, Jeanine should not have been injected with the stimulation serum and thus forced to destroy the programme. For future reference Neil Burger, if it ain’t broke, don’t fix it – In fact don’t touch it at all.